Islamabad – Faiz Ahmed Faiz was remembered as the symbol of hope, heroism and constant struggle for the people of Pakistan particularly for the youth and oppressed class by the academics on Tuesday. 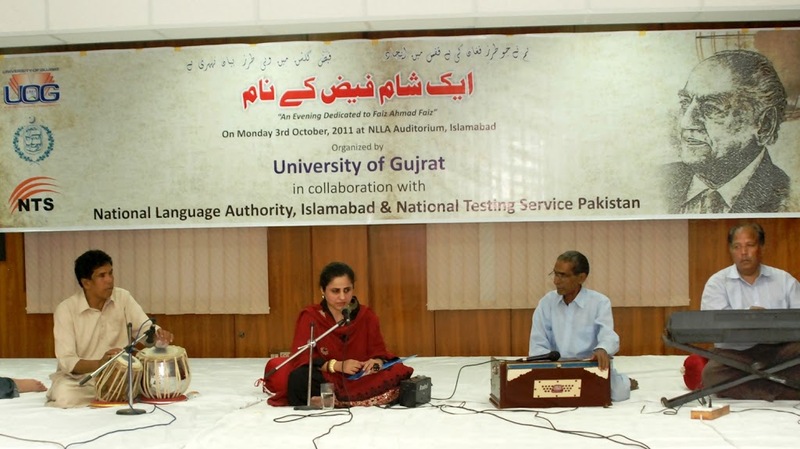 The poetry of Faiz was depicted in the form of mime act and musical performances by the students of the University of Gujrat (UoG). The event titled Aik Shaam Faiz ke naam (an evening dedicated to Faiz) was organized by UoG, in collaboration with the, Higher Education Commission (HEC) and National Testing Service Pakistan NTS. Students presented an impressive mime performance themed on the great poet’s optimistic poem “Umeed-e-Sehar ki Baat Suno” (Hark to the hope of the dawn). The act, portraying the efforts of Faiz in bringing revolutionary changes in oppressed society through his poetry was highly appreciated by the fully attentive audience. The event was part of centenary celebrations of Faiz being marked all over the world by the organisations that promote Urdu writers and writings. Murtaza Noor, Secretary General of Quaid-i- Azam Alumni Association was of the view that poetry and message by Faiz and Faiz is the real source of inspiration for the weak segments of the society. The event was attended by a number of literary personalities, teachers and students.